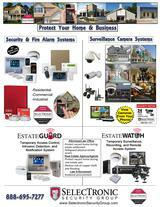 Camera systems are becoming a popular addition to residential and small business security systems. 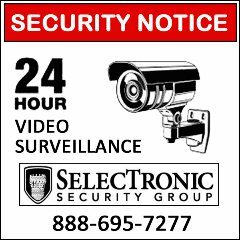 Whether you want to just record what is going on in your home while you aren't there or if you want to "check in" on your home or business from your Smart Phone or computer, our affordable surveillance cameras, monitors and DVRs give you the security you deserve on demand. The first video shows 2 young men smashing through a side door into a pitch black party room attached to the bar. Even though they wore dust masks and hoodies to hide their identity, they were previous patrons of the bar and were identified by the local police department from their walk and tennis shoes from other video camera footage throughout the bar. The second video shows a man smashing a window with a rock and breaking into a truck parked outside a tire shop. Stay with the video for about 60 seconds after he smashes the window then runs and hides in case the truck had an alarm or to see if someone heard the noise...BECAUSE HE COMES BACK! The third video shows what happens when you are not paying attention and think you put your truck in park then accidently hit the gas. The fourth video shows a pre-dawn drug raid in a residential neighborhood as the police drug team crashes the door. 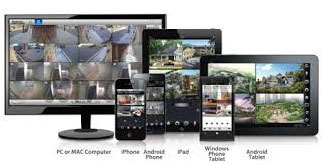 Wired or Wireless Cameras & DVR/NVR Systems: DVR(Digital Video Recorder) and NVR(Network Video Recorder) systems allows you to not only record and store weeks and sometimes months of video footage but also "look-in" on your cameras from any Smart Phone, Tablet, or computer...all you need is an internet connection to your DVR or NVR . 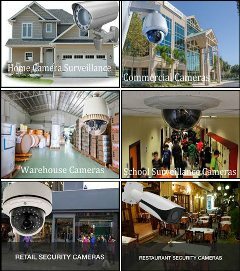 Hard wired analog, megapixel and HD cameras are utilized in most surveillance applications. Wireless cameras are portable and need no cables to connect to the DVR but every structure is different and can result in connectivity issues. Lower resolution wireless cameras may have a better connectivity percentage over high definition(720P or 1080P) wireless cameras just because of the amount of compressed data it must transmit to the receiver attached to the DVR. While these are better suited to wide open areas or short term applications where wiring is a challenge it is always better to have cameras hardwired/cabled from the camera to the DVR/NVR(see "Cabling" below). 1-DVRs are the most common of the control devices accepting analog(standard and high definition)digital signal input from analog cameras. High definition analog cameras(720P/1megapixel or 1080P/2+ megapixel) deliver a high resolution image but can only be viewed in true high definition on a compatable DVR(of which most DVRs now manufactured are a hybrid or tribrid allowing standard analog as well as high definition analog video input. Cameras are connected to the DVR either through Siamese cable, premade cables, or Cat5 with video baluns on each end(see below "Cabling"). Power is delivered to each camera via a 12v or 24v transformer/power supply. 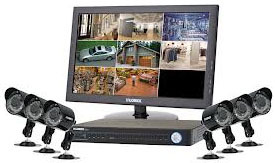 2-NVRs are used as the control device for IP cameras which are networked digital video cameras that transmit data over a fast Ethernet link(Cat5) connection. The video signal and power are transmitted together over Cat5 and the power is provided either through the NVR, a seperate IP Switch, or seperate transformer/power supply. Previously only IP/megapixel cameras had the ability to transmit high definition but were controlled through a NVR(Network Video Recorder). Neither analog nor high definition analog cameras are compatible with Network Video Recorders and IP cameras are also not compatible with Digital Video Recorders. With internet access, both DVRs and NVRs have the ability to provide remote access, control, and review via Smartphones and Tablets through downloadable Aps as well as webserver access via computers. 3-IP Servers are used as the control device for network installations in commercial applications where the IP cameras and Server are integrated into an existing computer network. 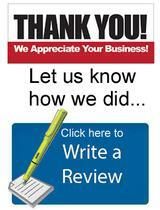 Servers are usually more costly and are usually installed and serviced through an IT provider. Most DVRs and NVRs contain on-board hard drive storage starting at 1 terabyte(TB) of memory which enables you to go back and review recorded activity. One(1) terabyte is equal to 1 trillion bytes or 1,024 gigabytes(GB). One(1) terabyte drive can hold approximately 150-180 hours of hi-definition recording or six to eight days of continuous recording for two(2) hi-definition(1080P/2 megapixel) cameras There are variables that can affect that including frame rate, video quality, etc. Our recommendation is always to set the DVR/NVR to only record when motion is detected through the view of each camera. This can increase the two-camera system scenario above from storing recorded video for six or eight days to 30-45 days and it makes it much easier to find recorded activity when reviewing video rather than fast-forwarding through hours of recorded video. 1-Siamese Cable: Siamese cable is built to include both video and power. In contrast to Power over Ethernet (PoE), the power is attached to the side of the data cable. PoE makes use of wires intended for data to transfer power. Siamese cable provides separately insulated wires of power cables and coaxial cable. This allows proper power to be provided without interfering with the video transmission. The connectors still need to be added to the wiring at the beginning and the end of the wire run. 2-Pre-made Cables: This is cabling that is lighter and thinner than Siamese Cable and already has the BNC and power connectors on both ends. These Cables are usually available in pre-determined lengths such as 25', 50', 100'. 3-Cat5: While originally used for data transfer, Cat5 wire has become the main go-to cabling for Analog, High Definition Analog and especially IP cameras. The reason is that it is lighter and easier to pull through structures, it can carry video signal up to 1000+ feet without amplification and can carry low voltage power up to 300-320 feet. 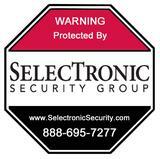 We can provide you with any level of camera surveillance that you may need to protect your home or business. From looking in on the house while on vacation, observing customer traffic flow at the store front, or viewing parking lot activity at the car dealership, camera systems are invaluable and almost a requirement in our lives.